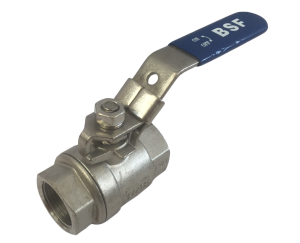 Designed as a disposable in line valve, where a full flow and minimal pressure drop is essential, e.g. in line shut off valves. Stocked from 1/4″ up to 3″. BSP Threaded – in accordance with EN 10226-1, ISO 7-1. Complete with locking device handle. Please Note: Not all sizes are necessarily from stock. Size: 1/8" 1/4" 3/8" 1/2" 3/4" 1" 1.25" 1.5" 2" 2.5" 3" 4"